Experience the road from the comfort of the RAV4, a SUV that has the features and the options that stand a cut above the competition thanks to advanced engineering and exceptional design that really makes driving more enjoyable and more fun. The latest representative of the RAV4 line comes standard with all the practical Toyota technology you deserve, including Toyota’s Star Safety System, Bluetooth controls, and the fantastic style that is sure to impress. The RAV4 has been developed with today’s drivers in mind, with a quiet interior that utilized high tensile steel to make the body stronger and lighter. This is complemented by sound-deadening material for a more inspiring and less intrusive experience, even on the nosier roads ahead. 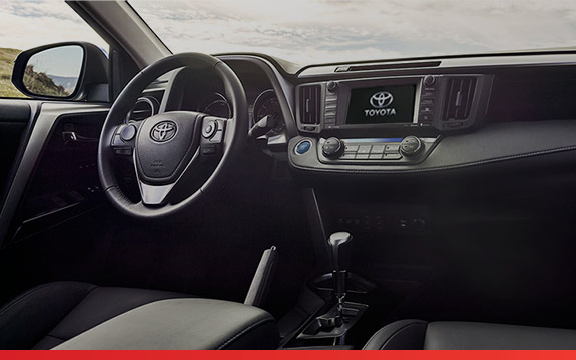 The spacious interior offers an improvement over previous RAV4 generations, while the options for FWD and AWD drivetrains is sure to provide drivers with the personalized touches that make driving better. Come down to Bathurst Toyota and test drive the RAV4 today! All the RAV4 models come with the fantastic 2.5-Litre 4-cylinder engine with some of the most advanced technologies on the market backing it up on the road. Included on this happens to be Dual Variable Valve Timing with intelligence (VVT-i), along with sequential multiport fuel injection delivery systems to improve efficiency and responsiveness. Speaking of, with the RAV4 you’ll get a combined fuel rating as low as 7.6-L/100 km on FWD models. Not bad, eh? Multi-mode transmission and three optional drive modes provide you with opportunities on the road to switch between Normal, ECO, and Sport modes. Then we have the models that offer AWD featuring Dynamic Torque Control systems that enable further enhanced control and safety when the roads are less inviting or the weather shifts against you. Now, when you discover the that RAV4 is available in 6 stellar models, we’re sure that you’re going to find one that speaks to you. Whether that’s the well-equipped RAV4 FWD LE or the RAV4 AWD Limited, there’s definitely going to be a model that stands out. Join us today at Bathurst Toyota and let our experts help you find the best Toyota RAV4 for sale on our lot. We look forward to assisting you!